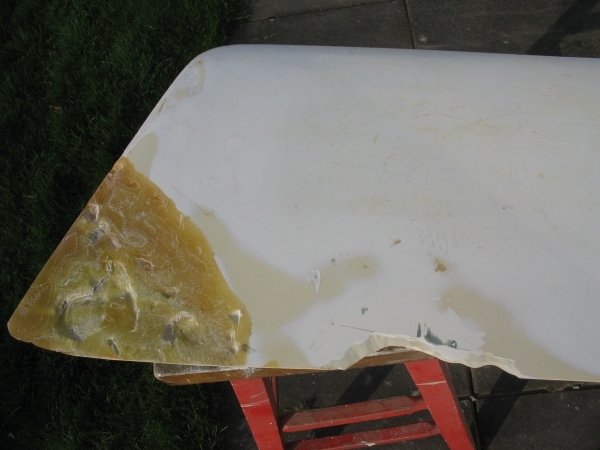 This broken and abused daggerboard/centreboard from a nice Laser 1 was repaired by its owner, I'll call him Ben, to spare his blushes. 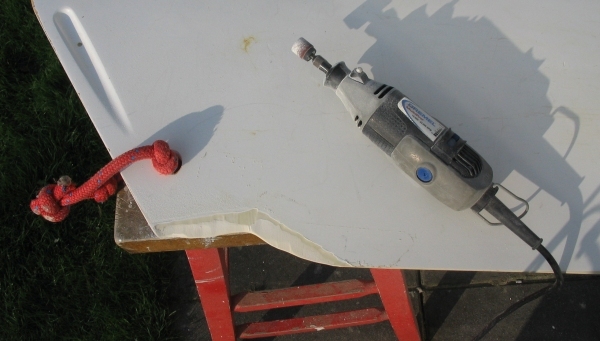 Ben used a fibreglass repair kit to fashion a new trailing edge tip. I'm amazed it fits into the boat. 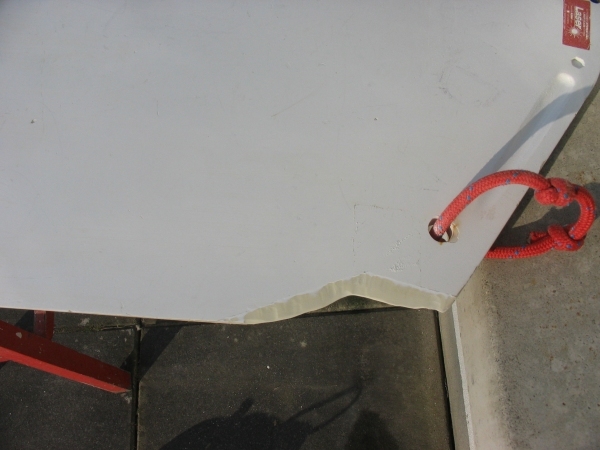 Another type of repair to the trailing edge. So much for a shape. 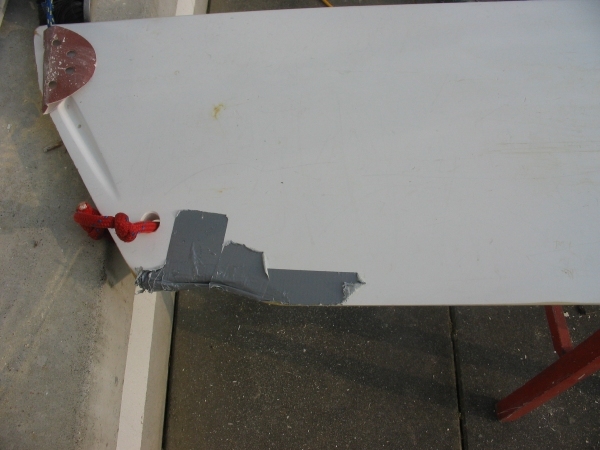 Another trailing edge break at the top of the board has been covered with duct tape. I HATE DUCT TAPE! It does not belong on boats! Too difficult to remove! Here is t'other side of the board. A nice day, I'll work outside rather than dust up the workshop. Having stripped off the duct tape and cleaned the sticky residue with petrol (the only substance I know of to do the job) we are left with this. 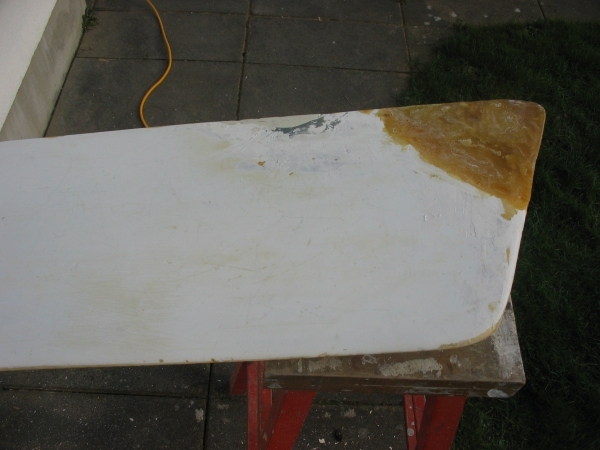 Shows the polyurethane foam that the board is made of. 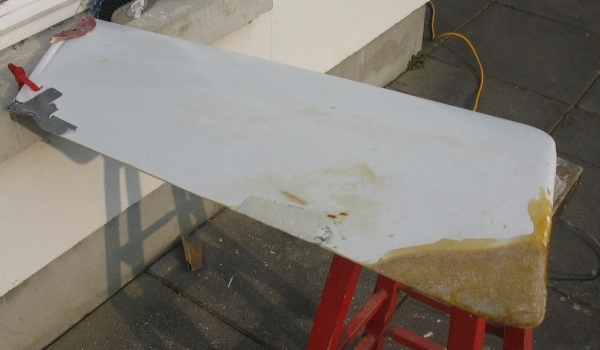 The white is sprayed paint, not gelcoat. A lattice of skinny steel rods inside the foam provides a skeleton-like support. 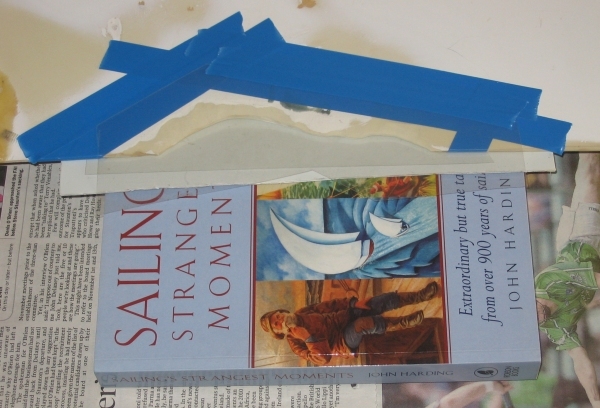 I started sanding...some of the filler simply fell off! That's Mr Bosch on the floor. Port side of the board. You can see a few air voids in Ben's repair, full of water! Back at the top, the wound has been chamfered back to allow plenty of grip for the repair. Mr Dremel is the man for this job, on both sides. 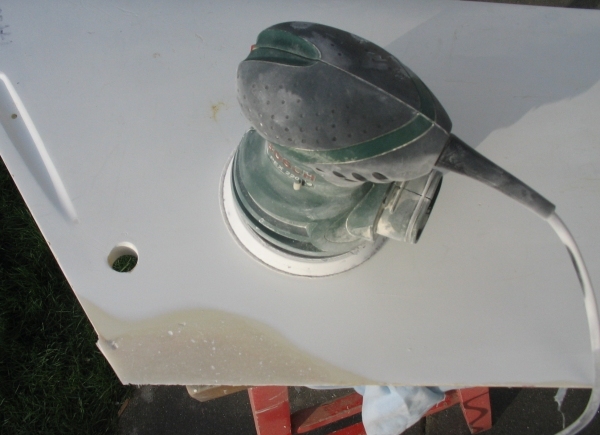 Starboard side, sanded and ready for Mr Dremel. 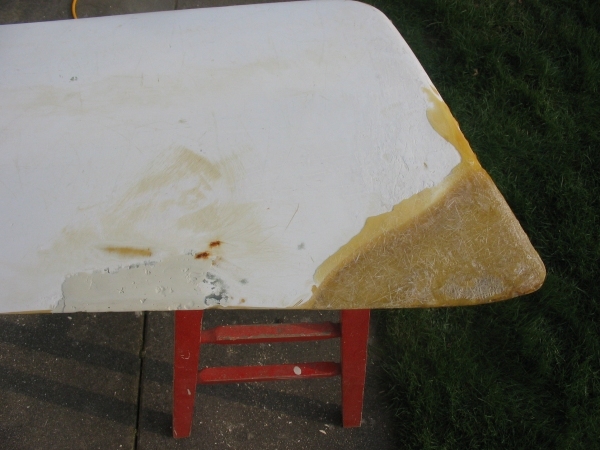 Dusted down and then washed with acetone (take care). 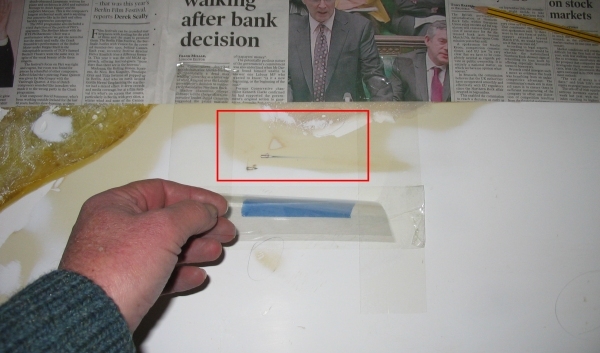 The toothbrush was used to clean sanding dust out of all the voids. 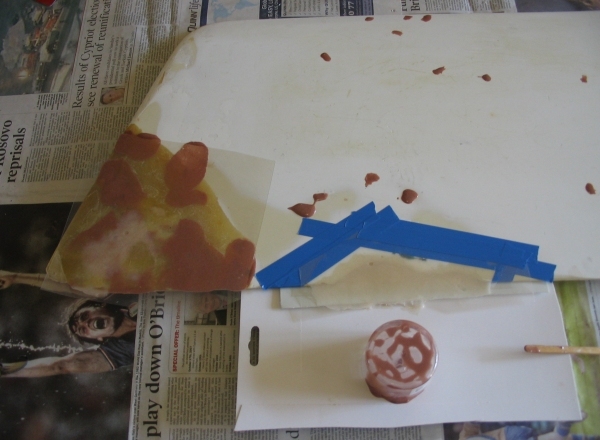 Now inside, ready to create moulds for the epoxy repair. 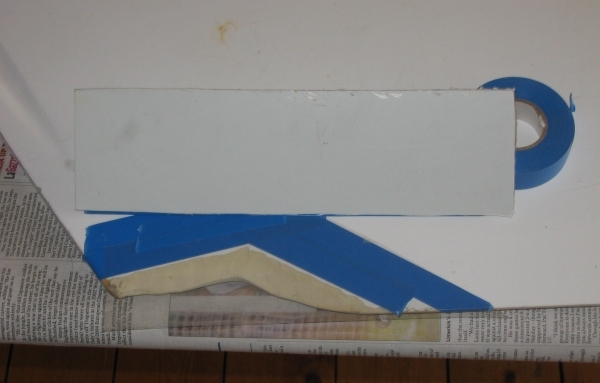 The blue tape provides a border, the clear acetate sheet beneath the board provides a smooth surface for epoxy, the hinged white plastic strip provides support. This is starboard upper. 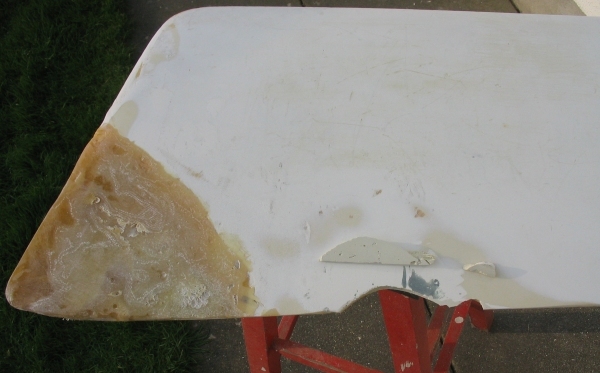 Here is port side middle, the board is resting on a book which helps provide support for the underside, a second acetate sheet is ready on the topside. This is a piece of CSM - Chopped Strand Mat, individual strands of glass held in place by a binding agent to make mat. 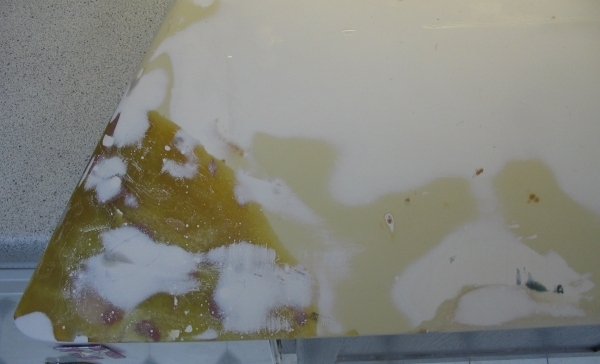 Polyester resin will dissolve the binding agent, but epoxy resin can not. 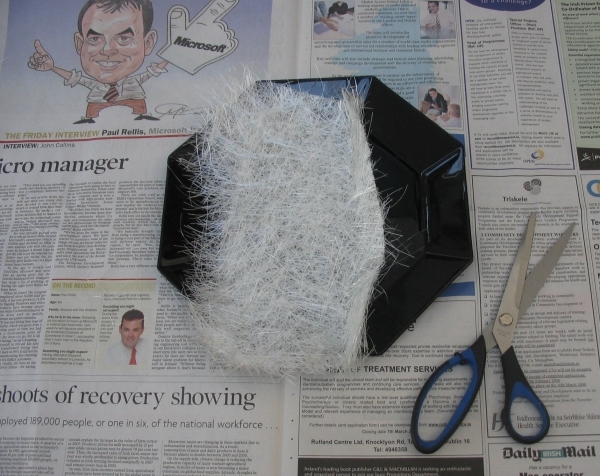 So, the scissors is used to cut the mat into very small pieces. 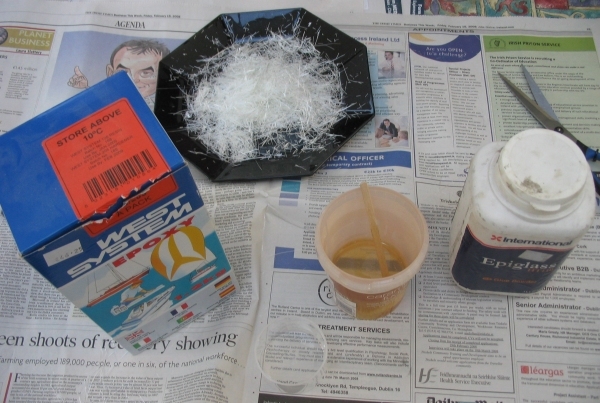 The very small, individual short pieces of glass are in the bowl, epoxy resin is mixed, a bit of glue powder will be added to the mix before adding the bits of glass. 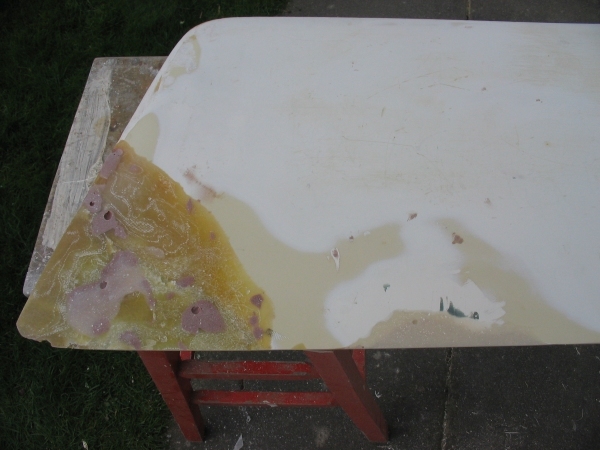 Here the epoxy-glass mush has been filled into both sides of the board and the acetate smoothed with a straight edge until excess oozes out, making sanding and shaping easier. Here is the other end, same idea. 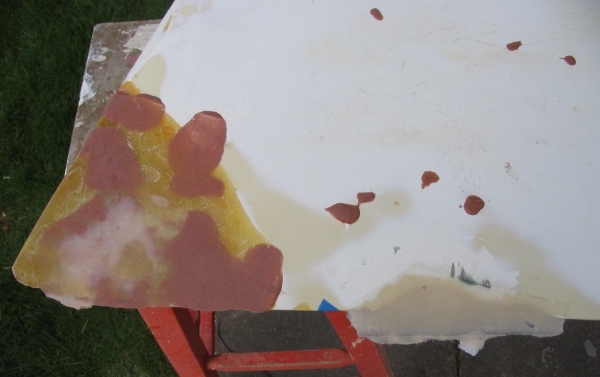 The brown stuff is fine fairing powder mixed with epoxy resin, good for filling voids and very easy to sand. No good for structural support, but great for filling holes. Thus far: two and a half hours. 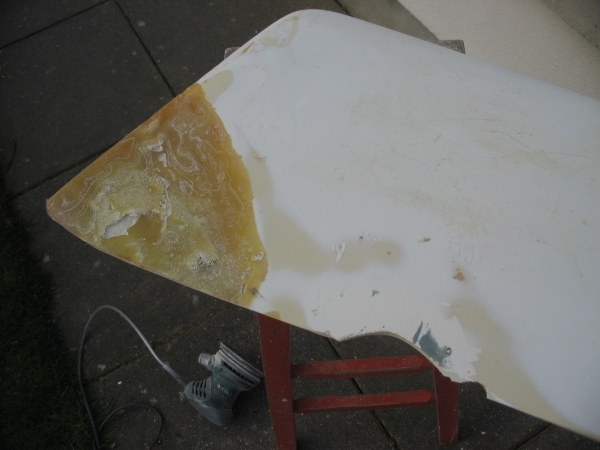 The next day, the epoxy has had 24 hours to cure (more than enough in the heated house) and back outside. 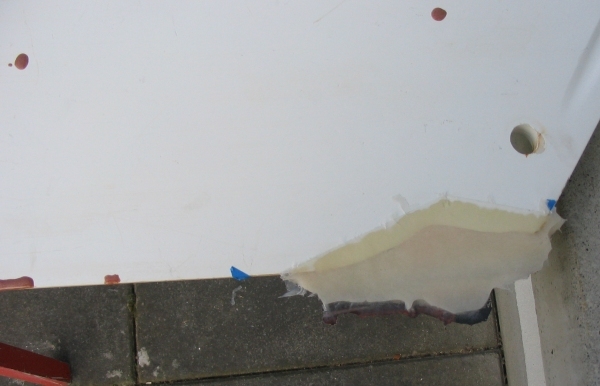 The two pieces of cardboard protected the books that were used to balance the board and help pressurise the epoxy filler. 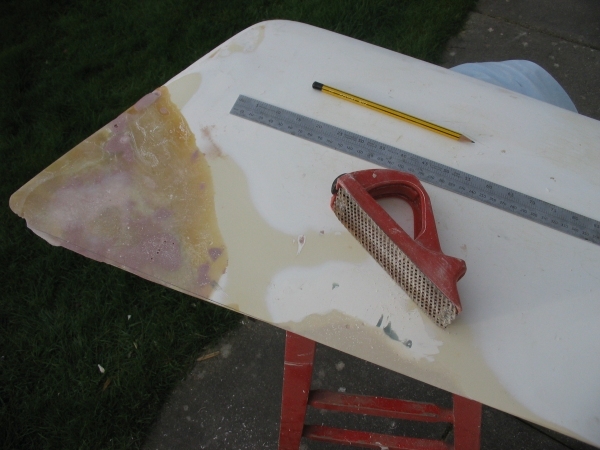 Cardboard and acetate stripped away, ready for sanding with 120 grit. The other end...the epoxy-glass mix is translucent enough that you can see the chamfered edges giving good structural grip. 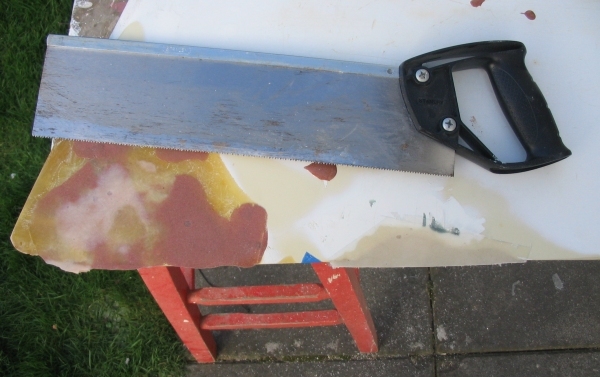 Panel saw used to cut away most of the excess. 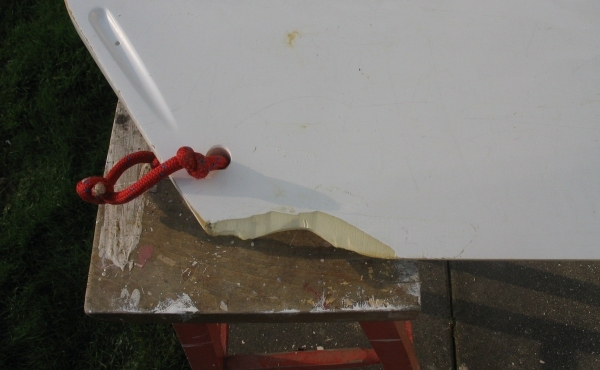 I use the red sureform to cut away the last of the excess on the trailing edge, Mr Bosch can't do that. The straight edge is a printer's "em rule" or "pica stick" from the days before computerised typesetting. 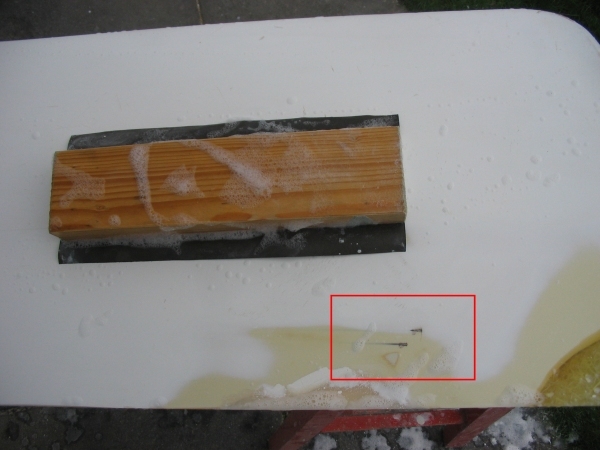 It is a very very straight edge, used to provide a guide for the sureform at the bottom trailing edge. Use a very sharp pencil. 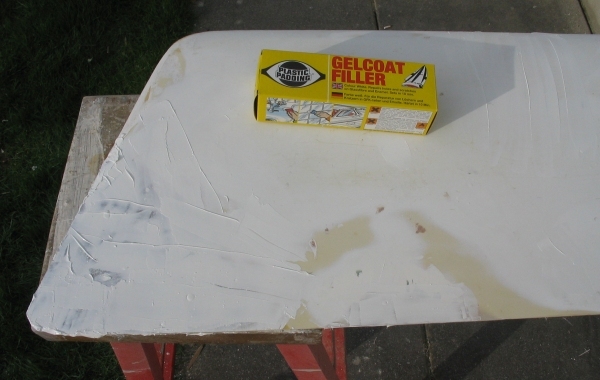 Gelcoat Filler is your only man, easy to mix, dries in 30 minutes, easy to sand. 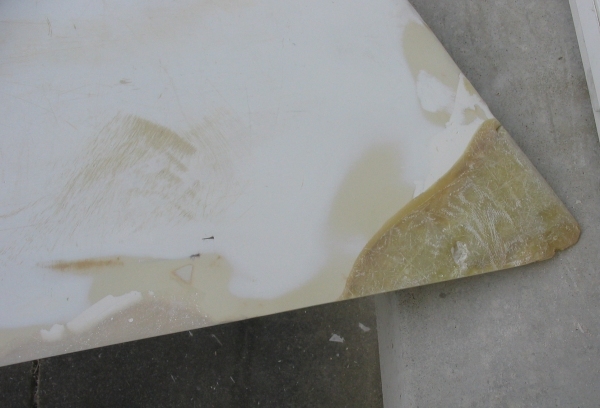 Good gap filling and smoothing properties, but brittle and useless structurally. 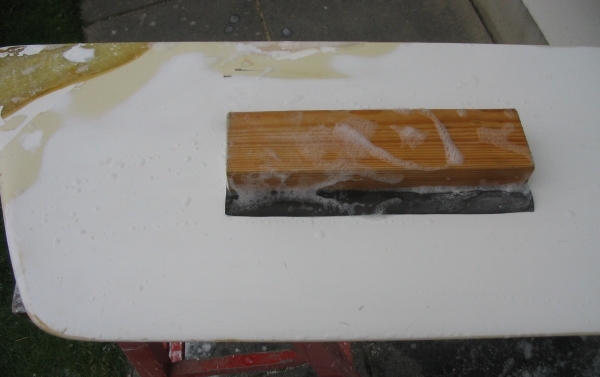 Later, I have been wetsanding, 320 grit, using a long block. Remember the skinny steel rods that provide a skeleton for the board? Here are two of them poking to the surface. Very bad quality control! 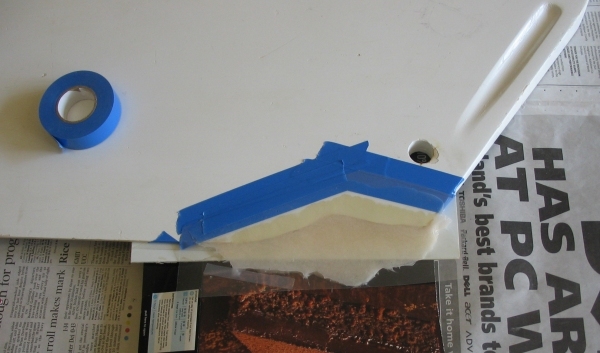 Back inside, make a surround well of cello tape, hinged acetate sheet, a bit of Gelcoat Fill and a straight edge to shape the stuff smooth. After drying and wet sanding. Yes, that area is a micron or two proud of the surrounding area, but tough! Every area wet sanded, washed, dried and cleaned with acetone, ready for spray painting in the garage. 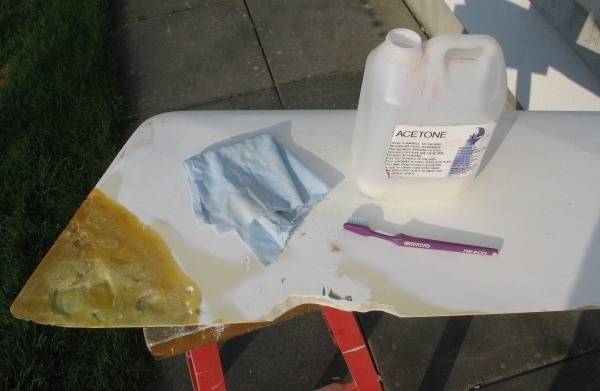 A coat of quick drying primer followed by Plasti Kote top layer, each takes ten minutes to apply, two hours to touch dry, 24 hours to cure. All done. Back to Ben for Sunday's Frostbite. 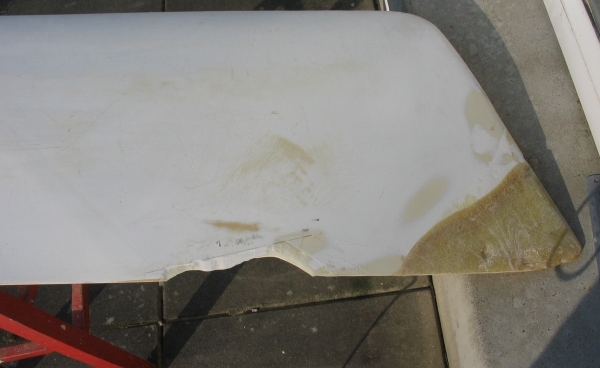 Note: When recovering from a capsize, DO NOT climb the trailing edge of the board, climb onto the leading edge.